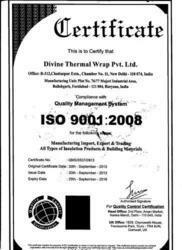 Divine Thermal Wrap Private Limited commenced its business operations in 2013 as a manufacturer of Heat Reflective Insulation Material, Thermal Insulation Material, Aluminum Foil Insulation and much more. Our range is highly admired by our clients due to their striking features like hassle-free performance, robust construction, high durability and thermal stability. Our product range is made using the high-quality raw material, most advanced machinery and under the supervision of skilled professionals. Moreover, we offer customization to our precious clients at market leading prices. Furthermore, our expertise in efficient strand mats at competitive prices has helped us in garnering a vast client base. The state-of-the-art infrastructure e possess has been laced with all the necessary machines, which facilitates the attainment of a number of the firm’s predefined goals and objectives. For reasons of attaining smoother and highly effective operations of the firm’s operations, the facility has been parted into a number of highly operational units. We are backed by a team of professionals who are experts in their respective domains. We have constructed an in-house quality-control unit, wherein our offered gamut is subjected to stringent tests on predefined industry parameters. In addition to this, our ethical work practices have helped us generate a huge and highly reputed client base. Under the leadership and guidance of our Mentor Mr. Rajeev Lal, attainment of success is simpler and efficient. His unmatched managerial skills and ability to make decisions have smoothened our path to success. Our team of highly skilled and experienced professionals, direct all of their efforts towards the attainment of a number of the firm’s predefined goals and objectives. For reasons of attaining smoother and highly effective management of the team’s operations, the professionals have been sorted into several highly operational units. The division is commenced based on the professionals, area of expertise. Further, regular training sessions are provided, for reasons of keeping them at par with the ever changing market. To us, quality is something of high importance. Thus we engage in the utilization of high-grade raw materials and modern machines, in compliance with the set industry norms and guidelines. Our Quality Control Department is fully-equipped to meet the toughest standards set by clients. Advanced testing equipment is used to ascertain different properties of the raw materials and to confirm compliance of the finished products with internationally recognized quality norms. In addition to this, for providing highly standardized products to our clients, we process the products through several rounds of quality examinations, where all manufacturing defects are examined and eliminated, with a high level of precision. We have a manufacturing facility which is well equipped with the latest machinery and equipment which helps us in making bulk productions. For this success, we are most indebted to our robust infrastructural base which we have built up with years of sheer hard work. Today, our company is equipped with world class in-house facilities for production, quality control, and R&D. The factory is loaded with a range of highly sophisticated machinery. Each stage of production is carried out under the supervision of our quality experts.